Ghaya Grand Hotel has won the Arabian Travel Awards 2018 for the Luxury Serviced Apartment Hotels category at a glittering ceremony held at the JW Marriott Hotel, Deira on September 20, 2018. The award was received by Ossama Kachkouche, Director of Sales and Marketing. 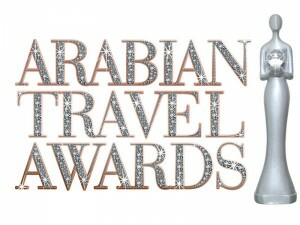 “We are extremely honoured to be recognised at the recent Arabian Travel Awards. It was a special feeling when all of our hardwork was acknowledged, it’s a seal of approval that we are on a right track and we should continue to maintain and improve our hospitality services.” Kachkouche said. Arabian Travel Awards is a platform for the Middle East to recognise people behind the success of the travel & hospitality industry to make them believe they are achievers. Planned as an exclusive one-of-its-kind event, this award ceremony is held annually. With many people putting their trust in the travel & hospitality industry, Arabian Travel Awards aims to host a world-class recognition for the best in the industry. Based on a unique system of jury, judgment and voting, these awards are fair and unbiased. Golden Sands Hotel Apartments was declared the Best Family Hotel Apartments at the 2nd annual Arabian Travel Awards. Mirna Tenidis, Director of Marketing of Golden Sands Hotel Apartments, received the award. Last year, the Golden Sands Hotel Apartments was recognised as the Best Brand Hotel Apartment. Mohammed Khoori, General Manager, Golden Sands Hotel Apartments, said, “The Arabian Travel Awards is one of the much-awaited awards in the industry. We are grateful to be recognised as this year’s recipient of the Best Family Hotel Apartments. This is a meaningful award because it reflects who we truly are. Our facilities cater to big and small families and our location is convenient for both young and adult guests. 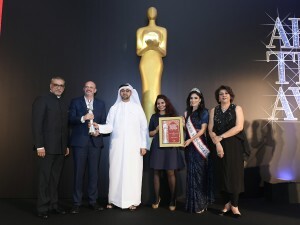 I want to share this award with the team who are relentlessly providing the best service to our valued guests.” Organised by Durga Das Publications, the 2nd Arabian Travel Awards recognised and honoured the best in the travel, tourism and hospitality industries in the Middle East. This year, more than 50,000 votes were submitted from over 25 countries, with nearly 60 awards to recognise at the exclusive event attended by VIPs, dignitaries, travel, tourism and hospitality professionals. During the awards ceremony, a beautifully designed Collector’s Edition Book was also unveiled that showcases the beauty and culture of the Middle East. With just a few days left, the Arabian Travel Awards is all set to recognise the efforts of the travel, tourism and hospitality professionals. The black-tie award show will be conducted in Dubai on September 20, 2018. An exclusive invitation-only event, it will involve some of the most prominent personalities from the region. The Chief Guest for the event will be HE Khalid Jasim Al Midfa, Chairman, Sharjah Commerce and Tourism Development Authority. Owing to the dedication and commitment of professionals working not only in the emirates, but also in the Middle East that has revolutionised the travel industry, United Arab Emirates has become a hub for travel, tourism and hospitality. The Arabian Travel Awards is a platform for the Middle East market to appreciate the efforts of the travel specialists who have contributed to the booming travel and hospitality industry. The Awards aim to encourage them to continue promoting tourism in the region, especially since all roads are set and ready for the Expo 2020 and beyond. Following a systematic method of internet-based voting, these Awards are fair and unbiased and are supported by TravelTV.news, TravTalk Middle East and TravTalk India – premier media partners for extensive coverage. The awards will be divided into four categories: Personal Awards, Business Awards, Trending Awards and Partner Awards. To name a few, these include awards for Best Business Hotel, Best Family-Friendly Hotel, Best City Hotel, Best Green Hotel, Best Leisure Hotel, Best Destination Management Company, Best Hotel Apartments, Best B2B Travel Portal and Best Luxury Hotel, among many others. More than 100 human resources experts from Dubai’s hospitality sector attended the 2nd Dubai College of Tourism HR Forum organised recently by the Dubai College of Tourism (DCT). The Forum was designed to provide recruitment and training specialists in hotels the opportunity to get a better understanding of UAE’s labour laws and find solutions to various work-related challenges. 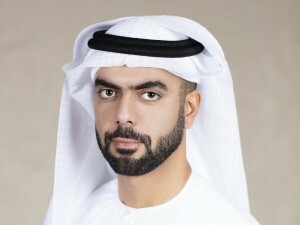 DCT, an institution established by Dubai’s Department of Tourism and Commerce Marketing (Dubai Tourism), plays a key role in human resources development in the emirate’s tourism industry and serves as a crucial link between Dubai Tourism and the trade to further enhance the quality of tourism services and the overall visitor experience. During the event held at The Address – Boulevard Hotel, speakers from government and private sector entities addressed the gathering of human resources professionals, covering topics such as Emiratisation, labour laws, and recruitment of staff. The participants were able to glean useful information and get advice from experts during the Q & A session that followed each presentation. Olivier R. Harnisch, CEO of Emaar Hospitality praised the work done by DCT and highlighted the fact that its Emiratisation objectives align with that of Emaar Hospitality. Major Majid AlZarouni, Head of Licensing Department, Security Industry Regulatory Agency (SIRA), a unit of Dubai Police that is responsible for the training of security guards, spoke on issues related to the hiring of security guards including their visas and salaries. The Elaf Group of Companies, a SEDCO Holding Group company and a leading provider of travel, tourism and hospitality services, has announced the opening of its latest five-star hotel in Jeddah. 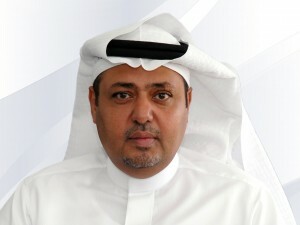 The latest addition to Elaf Group’s growing portfolio of hotels is part of its recent implementation of a strategic expansion initiative, aimed at further reinforcing its leading presence in the Kingdom of Saudi Arabia’s booming tourism and hospitality segment — in line with the goals and objectives of Saudi Vision 2030 to support the national economy and to promote tourism, particularly tourism for religious purposes, as a key contributor in the efforts to achieve a non-oil economy. Ziyad Bin Mahfouz, CEO, Elaf Group, said, “The new hotel is being expected to help address the demand for more hotel rooms in Jeddah, which clearly demonstrates the country’s rapidly thriving tourism industry — ably reflected in its continuous Year-on-Year (YoY) growth. Rest assured, we remain steadfast in our commitment to provide the highest quality of services to offer an unforgettable experience in our hotel and exemplary service to our guests. 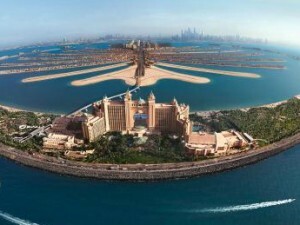 Connected visitor technology will drive the UAE’s hospitality market to top $10 billion by 2020, meeting the needs of millions of Expo 2020 Dubai visitors, experts announced on the sidelines of the Arabian Travel Market. With 25 million visitors set to attend Expo 2020 Dubai, the UAE’s hospitality sector is on a building boom. Dubai aims to double the number of hotel and serviced apartments leading to revenue of $10 billion, according to a recent report by Alpen Capital. As hoteliers jostle for position, they are aiming to stand out from their competitors through disruptive technologies to save time and money, and meet the preferences of Millennials. “Smart technology could revolutionise the visitor experience, for the millions of visitors set to attend Expo 2020 Dubai, offering a hassle-free end-to-end experience from the plane, to easy hotel check-in, to autonomous vehicles taking them to the exhibition pavilion,” said Savitha Bhaskar, COO at smart hospitality consultancy Condo Protego. The UAE’s hospitality sector is also rapidly adopting digital solutions to streamline hospitality administrative processes and enrich the guest experience, saving time and money. Increasingly, hotels are offering remote check-in, card-free room access, and Big Data analytics to monitor customer preferences both in-room and from partners. “For UAE hoteliers to manage guest data in real-time, they need high-availability, secure, and scalable data storage and management solutions. Condo Protego has seen strong success in enabling the UAE’s leading hospitality and leisure organizations to undergo digital transformation,” added Bhaskar. In the UAE, Condo Protego is seeing strong demand for solutions such as Dell EMC converged infrastructure, Isilon network-attached storage, XtremIO all-flash storage, and VERITAS information management and data protection solutions.